Hope it’s been a good start to your week so far. I know, Monday right!?! Feel like the days are just rolling past me, this year feels like it’s running too fast. Is it just me or do you think the same? Our recipe today: Palya – as it is called in Karnataka is a simple stir-fried vegetable dish tempered with some mustard seeds, turmeric, fresh coconut and fresh curry leaves. It is part of most home cooked meals and is normally had as a side dish to a main meal that includes rice, sambar or rasam. While the concept remains the same, there are slight variations to some ingredients across the different southern states. It is also called Poṟiyal in Tamil, Porutu in Telugu and Thoran in Malayalam. I’ve used beets here however you could use other vegetables or try a combination of two. This recipe works very well with cabbage (green and purple), green beans, French beans or carrots. This recipe serves 2-3 adults. Rinse the beets, peel skin and chop them into small pieces, the smaller the better as it will help it cook faster. Finely chop chillies. Then to a thick base utensil or wok on medium heat, add oil, once hot, add mustard seeds and as they splutter, add curry leaves and chopped green chillies. Sauté for a moment then add the chopped beets. Sprinkle salt and add some water to prevent the pieces at the bottom from burning, turn the heat to medium-low and cook for 15-20 mins with the lid on. Stir occasionally, add water a little at a time as you notice it evaporate. After the first 10 minutes add in the turmeric and grated coconut and mix well. Put the lid back on and cook for the next 10mins. Cook till the beets are cooked through then turn heat off and serve as a side of a main meal of your choice. Tip: You could run a fork or spoon through some of the beet pieces to check if it is cooked through, if not, cook with the lid on for a little longer. Remember, cooking with the lid on is key! 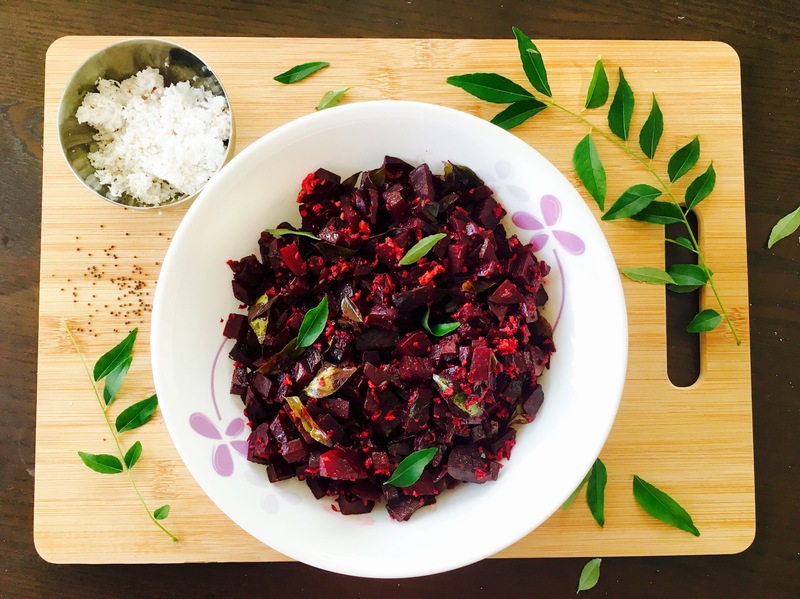 Beetroot poriyal is my favorite and I just love its sweetness !